It seems like a simple formula right? Crooked teeth plus family history equals somebody getting braces. Yet it’s not that simple. Previously, we talked about the different causes of crooked teeth, from genetics, dental accidents, and tongue thrust. Now with the first two, braces are the solution. A dentist should continue the normal process of referring those patients directly to an orthodontist. But with tongue thrust, it’s a different answer. Tongue thrust is a unique cause for crooked teeth because it’s constant pushing against the front of the mouth. While braces may help correct the teeth, that constant pressure slows and negates the work. Even if an orthodontist can get the teeth straight and the tongue thrust isn’t treated, the teeth will start moving back to their original and crooked positions. The first step is to find out if the crooked teeth are being caused by tongue thrust or not. Luckily, we have this free guide about how to identify tongue thrust in your patients. If you believe that they do have tongue thrust, then refer them to a trained orofacial myologist for speech therapy. With proper therapy, it can fix the tongue thrust, and afterward, the patient can be referred to an orthodontist to fix the teeth. 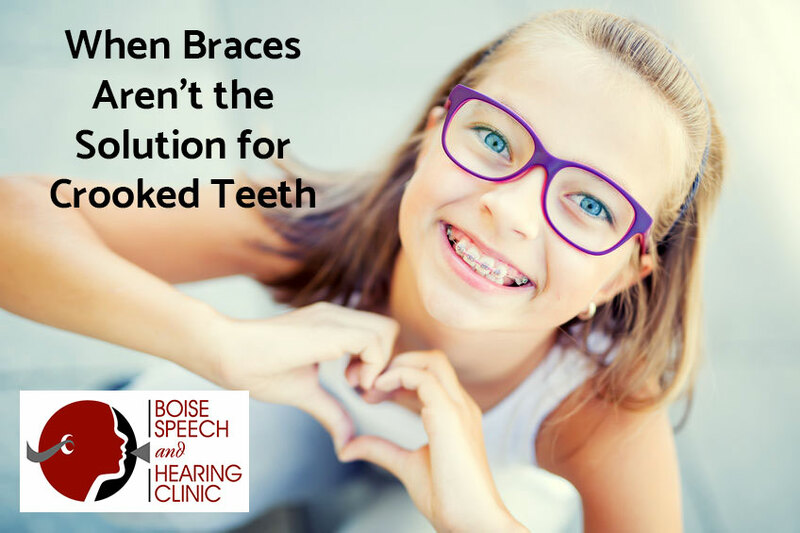 The Boise Speech and Hearing Clinic has multiple trained orofacial myologists and are experts in tongue thrust therapy. To read more about Tongue Thrust and see results, check out our Tongue Thrust page.